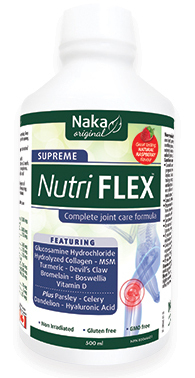 Naka's Nutri-Flex Supreme is newly formulated to help joint health and help reduce pain & inflammation. New formulation and new taste - Nutri-Flex Supreme comes in a delicious, Natural Raspberry flavour. Recommended dose: (Adults) take 15 ml daily. Avoid taking at bedtime. 1 bottle last 16 days by taking it as suggested. Direction of use: Take 15 ml or mix with half a glass of water or juice. Take with food. Use the calibrated measuring cup porvided to obtain an accurate dosage. Do not drink directly from the bottle. Duration of use: Use for a minimum of 1 month to help see the beneficial effects. Non-medicinal ingredients: Purified water, stevia rebaudiana leaf, potassium sorbate, ascorbic acid, acacia gum, xylitol, xanthan gum, licorice extract, glycerine (vegetable), malic acid, natural caramel colour, natural raspberry flavor. Contains no added gluten, dairy, corn, nuts, soya, eggs, wheat or yeast. Consult a health care practitioner prior to use if you are pregnant or breastfeeding or if you have gastrointestinal lesions/ ulcers, stomach ulcers or excess stomach acid, are taking anticoagulant agents, anti-inflammatory agents or antibiotics or before having surgery or if you have gallstones or a bile duct obstruction or if you are taking antiplatelet medication or blood thinners. Hypersensitivity (e.g. allergy) , Nausea, vomiting & diarrhea have been known to occur, in which case discontinue use & consult a health care practitioner. Do not use if you are allergic to plants of the Umbelliferae (carrot, celery) family. If you have liver or gall bladder diseases, and / or intestinal obstruction, consult a health care practitioner prior to use. Celery seed may increase UV light sensitivity, limit excess exposure to ultraviolet rays (e.g. sunbathing or tanning salons) for prolonged periods while using this product. If you have a kidney disorder, do not use. Known adverse reactions: Some people may experience mild gastrointestinal bloating, constipation or indigestion. Note: This ia a product with natural component, therefore, slight variations in the colour and taste are normal and do not affect the quality of the product.